Michael over at Drunk and In Charge of a Bicycle blogged this photo he took in... wait for it... Midtown Manhattan. My first reaction was to look for signs of photoshopping. Then I looked at the signs and buildings to see what city it REALLY was. Nope. Michael assures me that it is Manhattan. Quite remarkable. 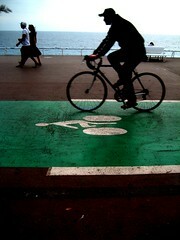 The green bike lane looks like French bike lanes, especially in Nice. While the scene above is progressive and admirable, Michael says that it is far from perfect in New York. 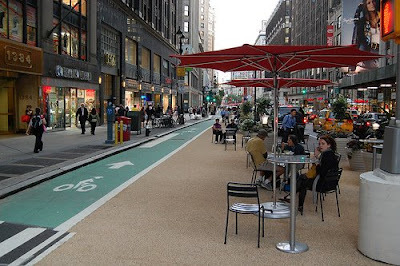 "The problem is that, while it might be part of a larger longer term plan - for the moment, there are just islands of little bicycle lanes - which barely connect to one another. So you can ride very safely for a few blocks and then suddenly it stops and you're thrown out into 5 lanes of traffic and no bicycle lane for 20 blocks until you get to the next nice little corner like this..."
Fair enough, but just the mere fact that the above scene exists and isn't a futuristic photoshopped 'artist's rendition' is good news.